The site of the Faerie Festival is now unrecognizable. After the unexpected attacks, the faeries seem to be using it as makeshift headquarters to rally for help, organize their forces, and make plans for their resistance efforts. Why don’t you look around and find a way to help out? Kaia seems to be in a trance of some sort. Her eyes are closed and she is murmuring something that makes no sense. As you make a quick note of whatever you hear, you can’t help but wonder what it all means. You wish you had some clue. 1. Copy down the first line of the puzzle. Refresh puzzle. 2. Copy down each letter that repeats, discard other letters. 3. Repeat on each line of puzzle. 4. 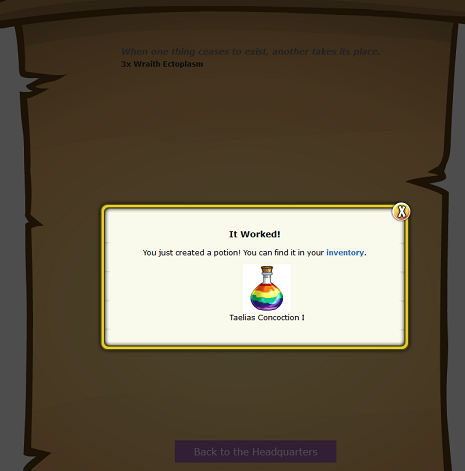 The letters will spell out a place in Neopia. IMPORTANT: You need to click the letters on the puzzle. You can NOT type or copy and paste the answer into the box. 5. Click each letter of your word and it will automatically show up in the answer box. 6. The answer will flash and turn into a link for you to start the next step. 1. Open notepad and set the font to the size 8. 2. 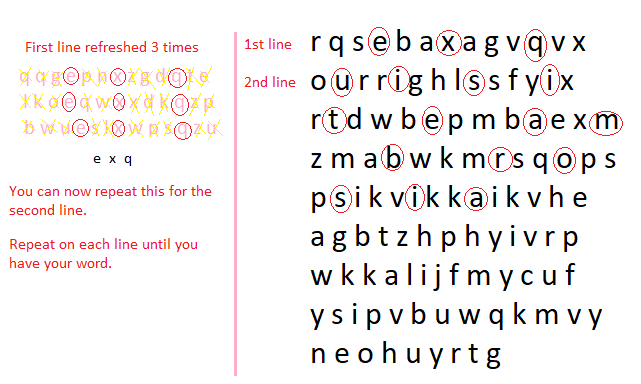 Copy and paste the letters from the puzzle to notepad so they all fit in one long line of text. 3. Click the reset button below the puzzle, copy and paste underneath the first line in notepad. 4. When you have 3 lines of text look for the letters that don’t change. 5. Reading from left to right will be the place name. 6. Click each letter of your word and it will automatically show up in the answer box. 7. The answer will flash and turn into a link for you to start the next step. anchormanagement, exquisiteambrosia, hauntedhouse, qasalandelights, slushieshop, turdleracing and uggashinies. The faerie has given you an intricate wooden chest. It looks ancient, and gives no clue as to the weapon it holds. There’s only one way to find out what lies inside! Start at the very inner lock and click anywhere on the chest as the next lock aligns with it. When it links up go to the next lock. Missing an alignment will release the last lock and you will have to re-align that lock to proceed. ** You need to do the Faerie Chest in 3 moves or less to get this achievement. 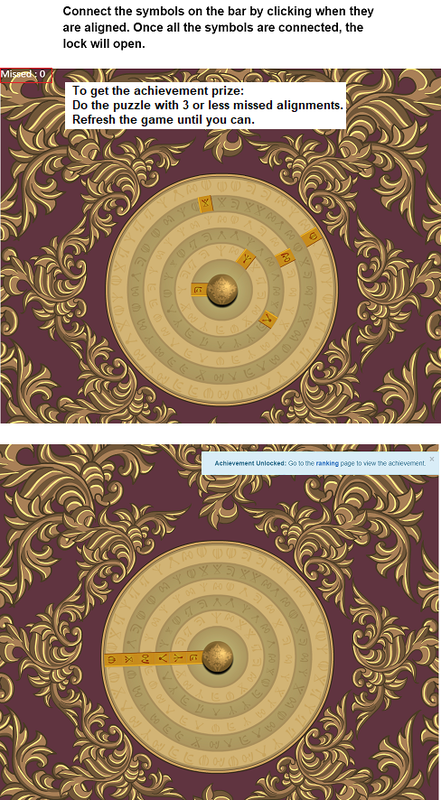 If you took more than 3 moves (counter is in the top left corner of the page), refresh and try again. Now we get a battledome challenger. You suddenly notice a group of Snapjaw Wraith heading in your direction! Go BATTLEDOMEFIGHT!!! 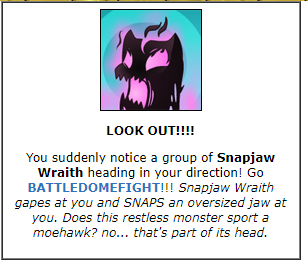 Snapjaw Wraith gapes at you and SNAPS an oversized jaw at you. Does this restless monster sport a moehawk? no… that’s part of its head. Goal: Fill your battle achievement bar to 100%. A Mighty win earns you 20% towards your Achievement, Strong win earns 10% and an Average win earns 5%. Method: Fight the Snapjaw Wraith either 5 times on Mighty, 10 times on Strong or 20 times on Average, or any combination of these difficulties. Both weapons are good. Equip both if you have nothing better. Staff of Devilish Laughter: 13 icons (8 air + 5 air). Does all 13 icons against wraith. NO TRADE. Really only worth it against the wraith for this plot. Taelia has always been known for her ski ll in healing Neopets with magic, so it was no wonder that Fyora asked her to help fight the dark magic plaguing the land. As you approach her table, you notice potions and ingredients of all kinds. Perhaps you can get her to create a potion or two for you. 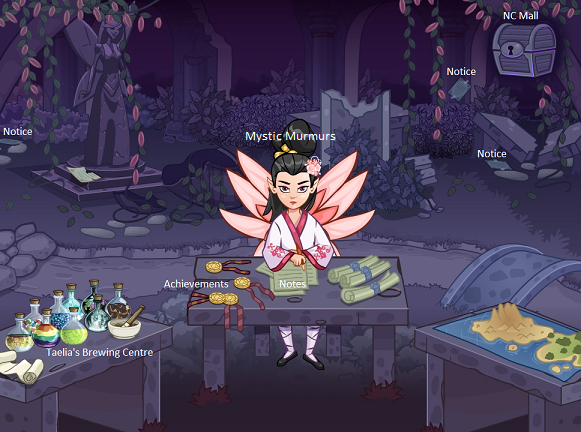 You peer into the scroll on Taelia’s table to see if it has any information you can use. Taelia must’ve been expecting just that, for her notes are phrased to hide more than they reveal. When one thing ceases to exist, another takes its place. 1. Battle the Snapjaw Wraith and win Wraith Ectoplasm. 2. You need 6 (3 for each recipe)and return to Taelia. 3. 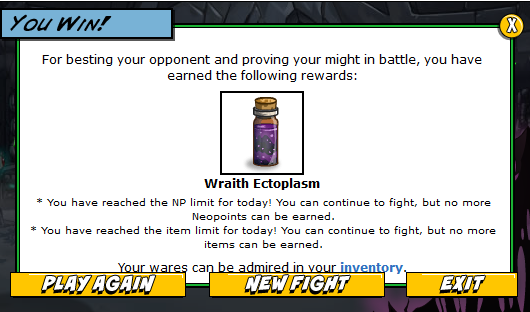 Click on the 3x Wraith Ectoplasm link on the scroll. 4. Receive Taelias Concoction I. 5. Repeat to get another Concoction I. 6. Go to the Giant Jelly and Giant Omelette. Use the concoction at the Giant Omelette and another one at Giant Jelly to remove the purple haze. A click sound? It worked! Facing an opponent head on in the Battledome takes a lot of courage. It is indeed a Golden Ivy Leaf. I verified it against the description in my textbook. Oh, that wonderful feeling that you get when you use your sk ills for the good of the world! Report to the Colonel about any sightings of the wraith! Some memories (like festivals), are worth reexperiencing. The war is currently an inevitable part of every Neopian’s life. We aren’t the colossi Xandra accused us of being. We must weigh the odds to avoid making any rash decisions. A set of three quotes randomly assigned. Faeries that are facing opponents in the Battledome are exempt from participating in the Faerie Festival. Guests that won prizes can collect them from the organizers. Neopians with reentry tickets may use the same ticket to revisit the festival as many times as they wish. Once the Faerie Festival has ended, the Soup Faerie will only supply free soup to poor Neopians. Remember, she knows your net worth. Rose vendors are not allowed inside the festival gates. Take care of our land – do not litter! Take care of your belongings. Objects left lying around will be donated to the Money Tree. To those wondering about the news, or lack thereof, I verify that you will get more information soon.